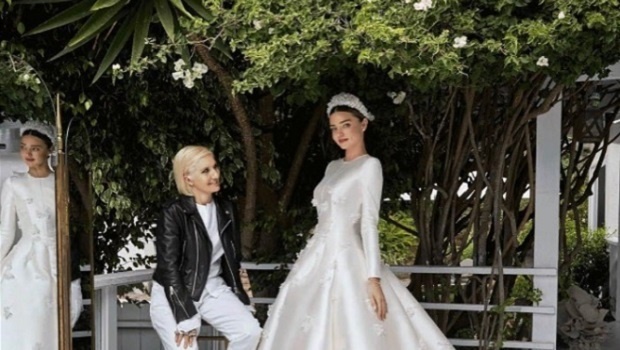 Lea Michele wants to wear wedding reception dress "again and again"
Australian model Miranda Kerr just got hitched to Evan Spiegel, co-founder of Snapchat, in a custom-made Dior creation conceptualised by Maria Grazia Chiuri. This gown takes my breath away. It is better than Pippa's, it's better than Kate's, it's even better than Diana's, okay? It's dreamy, whimsical, ethereal and something I one day hope to wear to lunch. According to Vogue.com the couple enjoyed an intimate wedding in Los Angeles for only 45 guests. All the wedding snaps were taken by iconic fashion photographer, Patrick Demarchelier. Naturally. Thank you Maria Grazia Chiuri and @dior for creating my dream wedding dress ????????? Read more about the making of the dress here.